In Remote Colombia, Prospects For Peace Are Clouded By Corruption The country's president and insurgents have pledged to sign a treaty, ending the Americas' longest-running conflict. But peace relies on small-town mayors, whose campaigns are often founded on favors. 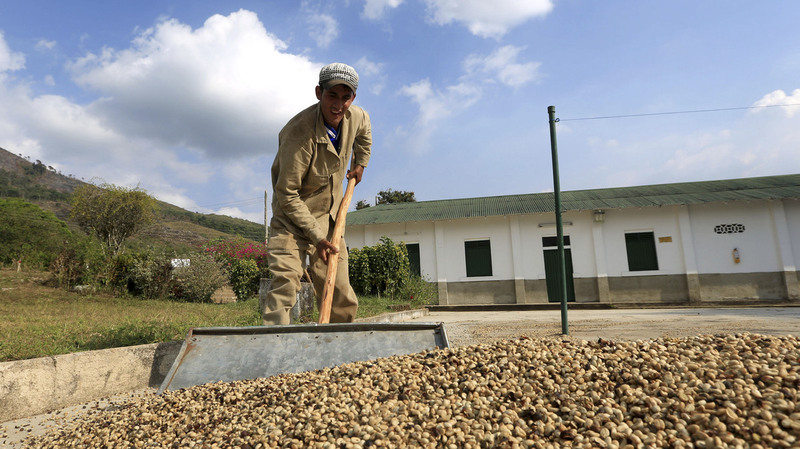 A worker collects dried coffee beans at a plantation in Pueblo Bello. The remote town, tucked in Colombia's Sierra Nevada, could be one of many where local elections determine the outcome of a possible peace. Saul Mindiola is running for mayor of Pueblo Bello — a farm town of 16,000 residents tucked in Colombia's snow-capped Sierra Nevada. The view makes it clear how the place got its its name, which means "beautiful village" in Spanish. Mindiola, who grew up in these mountains, is a member of the Arhuaco indigenous group. He's the first-ever mayoral candidate fielded by the group, which has long distrusted Colombian politics. Mindiola wears the Arhuaco's traditional robes and woven white hat; in speeches he uses the Arhuaco language. Even while addressing voters he constantly chews coca leaves. But he also has a college degree in business administration. On the campaign stump, he speaks earnestly about women's rights and the environment. But Mindiola fears he will lose due to electoral fraud. He claims his main rival is illegally busing in people from other towns and paying them to register as voters in Pueblo Bello. "It's not the residents of Pueblo Bello who will elect the mayor, but the people who are brought in from the outside," he says. Watchdog groups say widespread vote-buying and voter registration fraud could affect the outcome of elections in nearly half of Colombia's towns and cities. Many are remote, making the electoral processes difficult to monitor. What's more, impoverished residents often sell their votes for cash or favors. "You vote for whoever gives you a little bit of groceries, a little construction materials, a little bit of money — but you don't vote for the best person that benefits the community," says Andres Ceballos, who works for the Bogota-based Electoral Observation Mission. "That's just insane. Unfortunately that's been the logic here." Ceballos says it's vital for voters to choose wisely. Colombia's president and Marxist guerrillas — with help from Pope Francis — have pledged to sign a peace treaty within six months, potentially bringing to an end the longest-running conflict in the Americas. Under the peace treaty between the government and the Revolutionary Armed Forces of Colombia, or FARC, the new crop of mayors will be involved in disarming the guerrillas and undertaking other key programs. "This is what's going to define — especially now that we're in peace talks — who is going to implement at the local level whatever is agreed to," Ceballos says. But in Pueblo Bello, which has been free from rebel attacks for the past decade, voters have more immediate concerns — like recent storm damage to their homes. One woman, for instance, tells Mindiola that she and her friends will vote for him if he gives them roofing materials. Mindiola turns them down. Such favors, however, are common from electoral fixers like David Hernandez, who works for a rival candidate. He says he was hired by Francisco Villazon to scour nearby towns and find people willing to vote for Villazon. Each recruit, he says, will receive about $30 — plus lunch — on Election Day. He admits corruption like this has helped produce a string of terrible mayors in Pueblo Bello. Still, Hernandez says he needed the $200 that he was paid to buy food for his 11 children. A spokesman for Villazon denied that his campaign was engaged in electoral fraud. But poll-watcher Andres Ceballos has documented irregularities in plenty of towns. At a time when Colombia is trying to put a peace treaty into place, he finds this worrying. "Many people concentrate on national elections because it's the big-picture thing," he says. "But I think it's locally where elections can be decided and affect where the country is going."